NYFW day three consisted of a bit of running around, a whole lot of beautiful FW 14 collections, some people watching, catch up sessions with friends from near and far, and a whole lot of food. The day started out on a fantastic note with the Ruffian show first thing in the morning and I was able to snap these quick pics of my day 3 outfit afterwards. My new favorite designer, Vassallo - the creator of the beautiful top I'm sporting, is a man we'll have to talk about later on. Yes, I'll be dedicating a whole post to this brilliant Puerto Rican and his fab RTW collection later in the week, once the craziness dies down. In the meantime, here are the details of what I wore for day three including a whole lot of Soria Z Jewelry pieces that I'm in love with. Oh! And if you don't know yet, I've taken over Soria Z's Instagram account for the week so don't forget to follow along! love this look! That bag is gorgeous and that coat is amazing! You look so pretty–I love this jacket! It's so different from the winter styles I've seen recently. Love and dying over those shoes! Love love love that coat. Such a gorgeous look! Adorable coat! That first picture is divine. I love your coat Viv. I hope you are having a fantastic time! 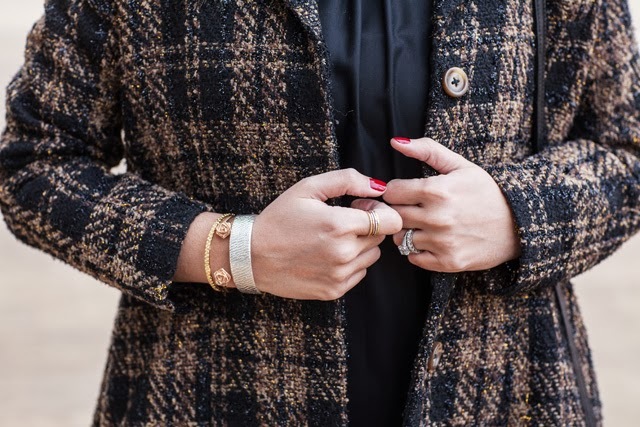 Adore the coat but in love with the rose cuff! How gorgeous! M.Mae. Loved seeing this outfit on instagram, especially that first photo! Love the bag Viv!